Posted by Mark Tuttle on December 1, 2018. Christmas has begun. 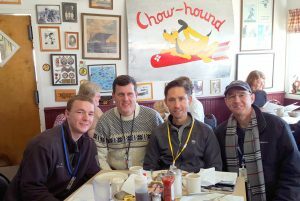 I had planned to fly the club plane to Nantucket for the annual Christmas Stroll down Main Street, an informal fly-in that had been organized by members of the Fitchburg Pilots Association on the New England Pilots Facebook page, but family constraints made a shorter flight a better idea. 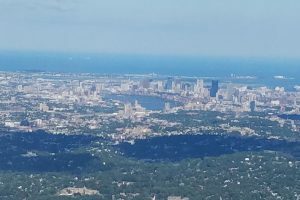 I ended up flying to Groton on the southern Connecticut coast instead. 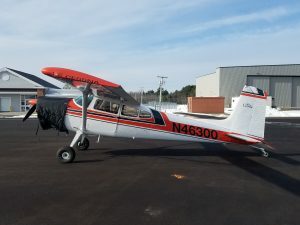 The last time I had been to Groton was in a Citabria to attend a fly-in organized by the legendary Angela Rodriguez Leedy and her yellow Top Cub with her man-eating tundra tires. I had expected the weather to be basically clear, but found a thin, broken layer of clouds at 3000 feet. I started off flying under the clouds, but then thought, “This is stupid,” and I found a gap in the clouds and climbed up above the clouds to 4500 feet. What a view. What calm above the turbulence beneath the clouds. Later in the day, on the flight home, I climbed up to 5500 feet and got an even better picture of what was going on with the weather. South of Worcester, I saw smoke from a smoke stack climb to 3000 feet and flatten out at the top as if it had run into a flat, glass panel. The picture of the temperature inversion, a cold layer of air on the bottom and a warm layer on the top, had never been painted so clearly for me before. 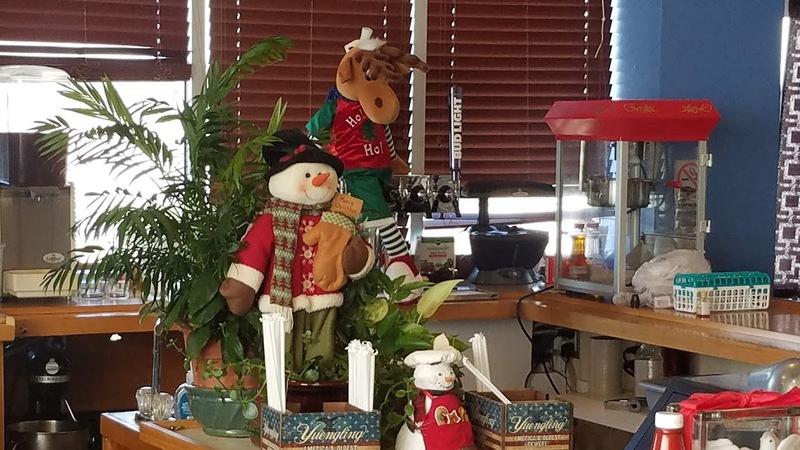 At the Groton airport, I walked into Cafe 511 and was greeted with a cheerful surprise. 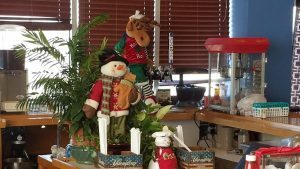 The restaurant was decorated for the Christmas season, complete with a baby in a bassinet sucking down a bottle of milk, and an advertisement for a visit by Santa next weekend. I had a great Cuban ham sandwich. Even the controllers were in a cheerful mood. Imagine that! Posted by Mark Tuttle on November 18, 2018. I skipped church on Sunday to fly to Lewiston (KLEW), Maine, in the morning and drive down to Boston for a concert by the Bach, Beethoven, and Brahms Society in the afternoon. What a day. This was a couple days after a minor “nor’easter” had dumped heavy, rain-soaked snow on the region, so I showed up with heavy boots and brooms, shovels, and ice chippers to get the plane out of the ridges of snow left behind by airport snow plows. Indeed, I arrived to find the tarmac… clear. Not a trace of snow on the plane or in the tie down areas. The plane started on the third blade after a good preheat, and climbed like a rocket in the cold, dense air. The visibility was so clear that I could see the snowy peaks of Mount Washington blazing in the sun from 40 miles away. Visibility was so good that I ended up navigating the entire flight via two large lakes, a familiar smoke stack, and an extremely large ocean off the right side of the cockpit. The weather was generally high overcast with light wind, some of the smoothest conditions I’ve experienced recently. The plane nearly flew itself to Maine. But best of all was an orange-and-white Cessna 180 parked on the ramp, one of the most perfect examples of that aeronautical station wagon I’ve ever seen. That plane radiates it’s own kind of religious experience. Posted by Mel Suarez on August 14, 2017. 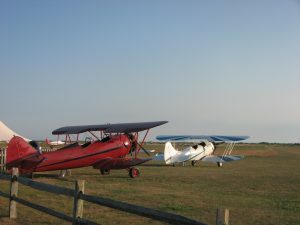 What is it about flying with a friend, a fellow addict, who thinks, breaths and eats aviation? Simple question…or maybe not. 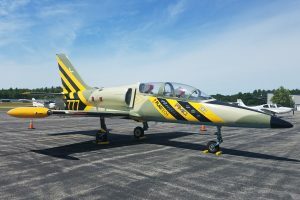 Andrey is building a homebuilt, owns and rents out a couple of airplanes and has his sights set on a crazy, wonderful SLSA (whatever that is) that is being designed as we speak and is due to come out in the next couple of years called a Raptor. What an airplane…but I digress. So he comes over to N9323J and I hear his amazing greeting as I get the cover off “Hey, Mel, how are you?” Big smile on his face, a certain confidence in his gait as we are going to fly for fun. We don’t HAVE to fly, we don’t have a mission other than to fly over my house in Chelmsford and do a couple of turns so the wife can see us, then fly to Fitchburg and back. It’s a trivial mission…and that’s what a hobby is about. He’s flying a LOT as he’s looking to get his IFR rating soon. I fly 1/month for an hour or so as I have another intoxicating hobby – flying drones with FPV (i.e. with an on-board goggles view). 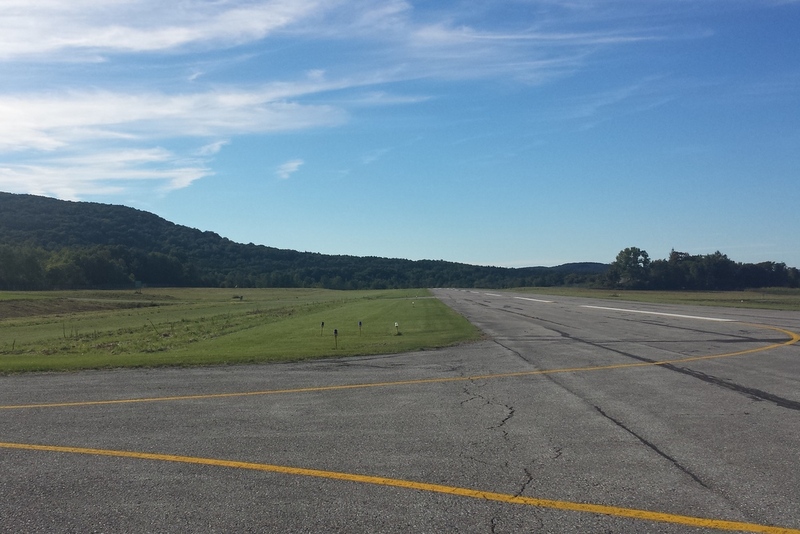 We get to Fitchburg and there is no restaurant any more…the kiss of death for a small airport. However, the locals tell us the EAA has free coffee & doughnuts every Saturday morning in the hangar next door. We trade flying stories…I did a side-slip to bleed off a bunch of altitude before landing (you put the plane at a crab angle – the most aerodynamically inefficient way to fly) and hold it until you get closer to the ground. For some reason I was not nervous in the least which was cool. Had only done it one other time w/o the instructor in the right seat. You can do anything with an instructor in the right seat. “Sure sweetie…I did.” I lied and so I laughed. She knew it. After hanging out and talking trash “with the boys” we got back in the Cherokee and man…the thing climbed like a rock during takeoff…due to the conditions. 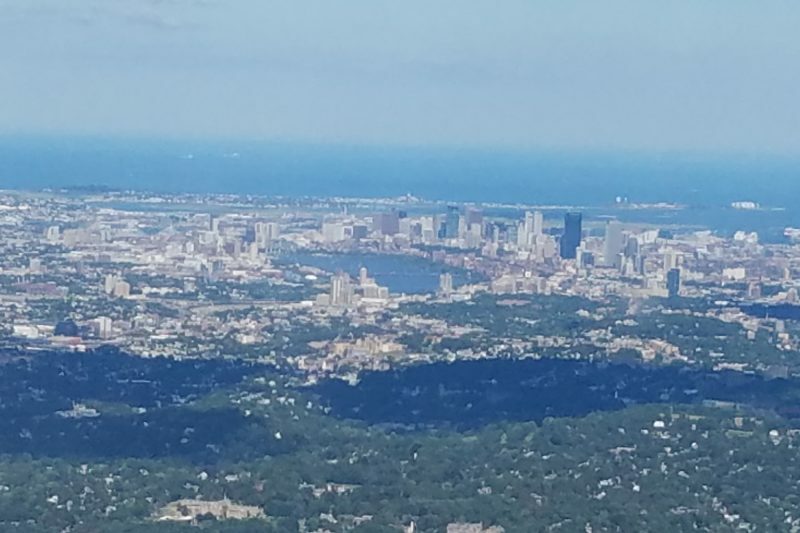 But we got up “into the pearly skies” and sauntered back to Lawrence, the Merrimack below, 495, the abandoned airport and then KLWM. 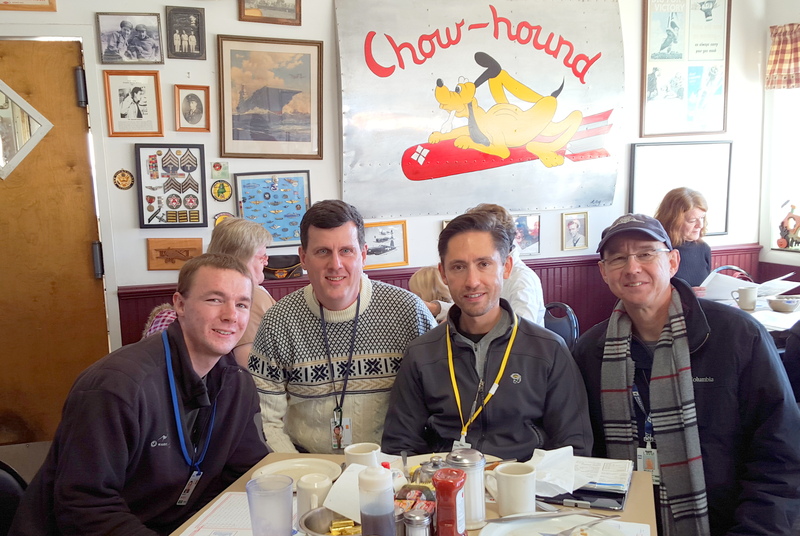 Landed at Lawrence and was happy to grab lunch at the little restaurant enjoying the young families enjoying the aircraft taking off or landing, the good food and the warm New England light winds. Real nice to fly with a friend…I recommend it…or simply to fly. Posted by Mark Tuttle on July 30, 2017. 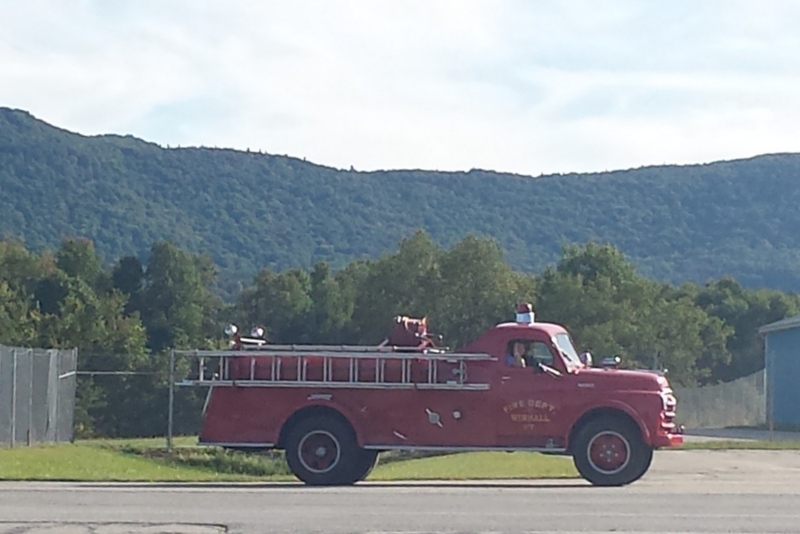 You never know what you are going to find when you take off for an innocent adventure on a Saturday morning. My son bailed on our plans when he discovered an opportunity to pregame for his formal birthday party on Sunday with an informal gathering of birthday friends on Saturday. Premonitions of “Get away from me, Dad, you’re bothering me…” likely to come in five or six years. So I’m off on my own for breakfast at Sanford, Maine, with one additional stop so I can legally log it as a cross-country flight. Low-level turbulence makes me look like a fool down low, but passing through a thousand feet the air smoothed out into a strong, steady stream of air. After finding a heading that works, I can almost put my feet up on the panel and let the plane fly itself to breakfast. At the restaurant, I’m offered pancakes with orange and cranberry. 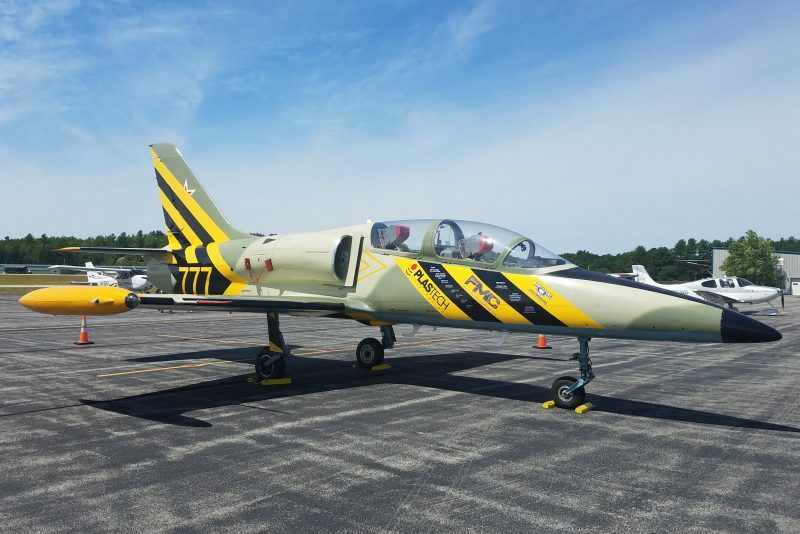 And then I walk out to find this: An L-39 jet trainer designed in Czechoslovakia in 1964 and produced through the 1990s, this one with a red Russian military star on the tail peeking out from behind a yellow-and-black paint scheme naming what appear to be corporate sponsors of the jet. And most amusing was a to realize that sitting on the left of this military trainer from the Soviet era was a Cessna from the Civil Air Patrol. Taxiing back to the runway, I passed a man working on the tube frame of what was likely to become a tube-and-fabric airplane. 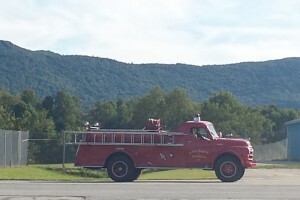 Near a spot where I’d once before passed a large Grumman flying boat. It was a good day. A better day than one pilot was having as I landed at one of my stops: “Cessna 123, hold short, landing traffic.” “Okay, cleared to take off.” “No, hold short, landing traffic.” “Cessna 123, line up and wait.” “Okay, cleared to take off.” “No, line up and wait.” It would be tempting to shake my head at that pilot, but I knew that a few hours later my son would be shaking his head at me. Posted by Mark Tuttle on June 23, 2017. Here’s an adventure that doesn’t come often to the Greater Boston area. 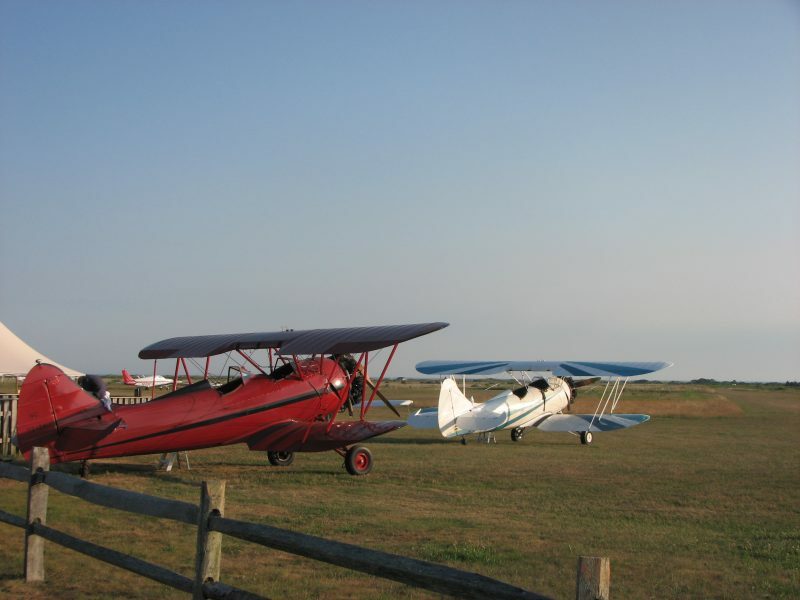 Ever thought about flying a tail-wheel airplane? How about a seaplane? How about a mutli-engine airplane? How about all three in one?!? Say hello to the Twin Bee, a twin-engine version of the Sea Bee, developed right here in Norwood, Massachusetts, in 1960. The airport gossip is that only six are still flying. The Wikipedia page says only 23 were built. 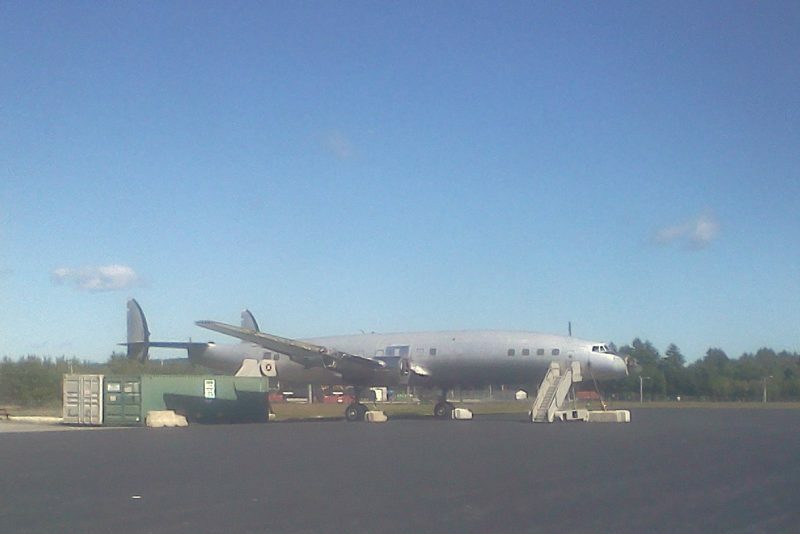 But now there is one sitting at the Bedford airport from now through October with your name written on it. 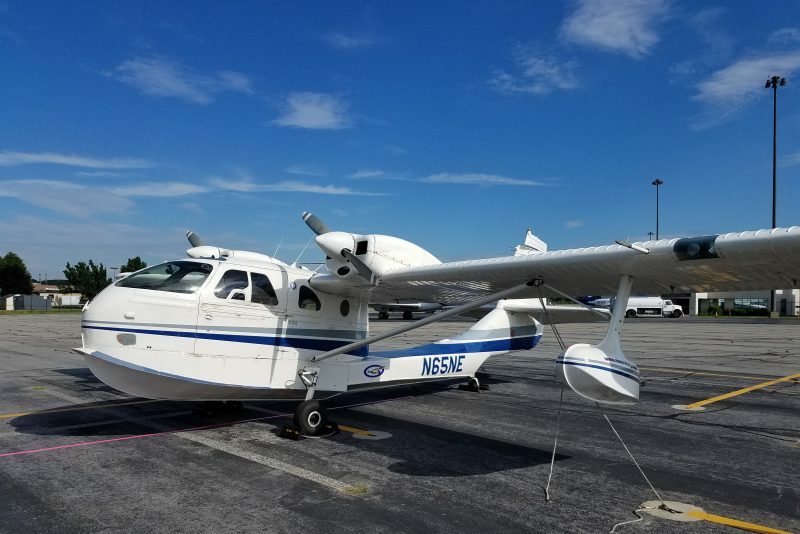 Go up to Maine to get your seaplane rating at Twitchell’s Seaplane Base (3B5) in Turner, then call Rob Valleau at East Coast Aero at Bedford (KBED) before October for your multi-engine seaplane rating. Then come back to the Hawk Flying Club and tell all your friends about your adventure. Posted by Mark Tuttle on November 15, 2016. Such a refreshing experience it was to fly this morning. The weather was calm with an even overcast at 4000 feet and light drizzle forecast to change to light rain later in the day. The plane, properly trimmed, climbed hands off to cruising altitude, and then out to the practice area. Approaching the ocean, a thin layer of clouds at 2000 feet below pushed in from the ocean just over the shoreline. Clearing turns, gentle turns, steep turns, slow flight, take-off and landing stalls both turning and not, everything flown in calm conditions with just the lightest touch on the controls. There is nothing like it to feel the physical connection to the machine and the weather, a connection so deep you can feel the plane wanting to fly the maneuver itself. Coming back to the airport for landings, both short-field and soft-field, the plane flew itself to the runway. Trimmed for final approach, flying almost hands-off, the whole experience evolved so slowly, so gently, so peacefully. We are lucky to have a plane that so much loves to fly. Posted by Mark Tuttle on October 31, 2015. Four friends arrive in three planes at the same airport for breakfast at the same time! What are the odds? The restaurant was the Cockpit Café at the Sanford airport in Maine, so the odds are pretty good. I drove up to the Lawrence airport at dawn. I felt the sun rise behind my shoulder and set the orange and red leaves ahead of me on fire under the frost. I turned the plane into the sun and scraped the frost off the wings. I took off and turned north. I prepared to work hard on maneuvers on the way up to Sanford and breakfast, but within minutes it dawned on me that this was the start of a special day. The winds were forecast to be calm thousands of feet into the air. The visibility extended forever. The fall leaves below were crisp and clear. This was not a day to waste on hard work. I trimmed the plane for cruise and pointed it in the right direction and let the plane fly itself to Maine. I stopped at Skyhaven to practice landings on the way home. They were using the northwest runway with a quartering tailwind which was a little exciting. Coming in for my first landing, I heard a gaggle of planes on the radio coming in behind me. I took off again and turned right to go back for another, and pulled in behind a flock of RVs coming in to land. I lost track of the last one, waited a little while to find him, and finally had to ask for help. “Skyhaven Red RV, say position.” “I’m on the runway about turn off.” “He’s really more orange than red.” “He’d be beautiful in any color.” Pilots are funny. Maybe a little difficult at home, but funny at airports. Posted by Rich Ells on July 13, 2015. I flew to Katama this weekend! If you haven’t flown to the Vineyard, do it! Since it is grass it’s technically a soft field but it’s very firm. Still a good idea to use your soft field technique though. It’s like a step back in time when you land. 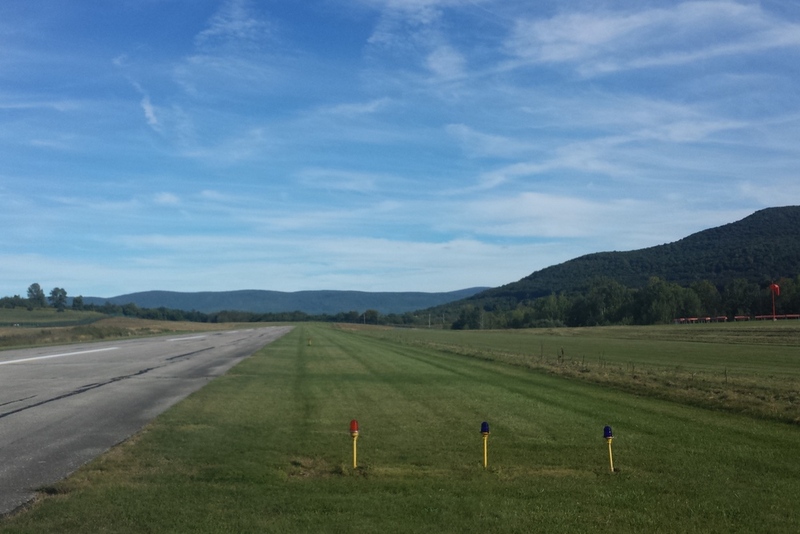 The runways are a little difficult to pick out at first, but once you’re familiar the airfield it becomes easier. Take a good look at the field on Google maps. The runways are numbered with white stones. 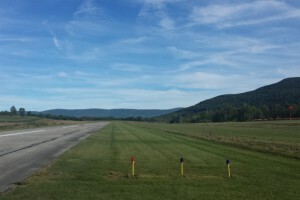 There are 3 runways, the most common one is 21 which runs alongside the road. Look just to the left of the road nearest the restaurant with the planes parked nearby and you’ll see it. 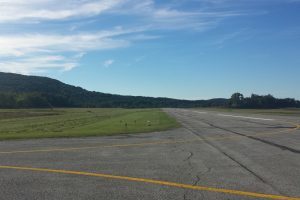 There is a landing fee which varies depending on how long your staying, whether or not you’re going to the beach (there is a separate parking area at the south end of the field). We paid $10: $5 landing fee and $5 for 1/2 day parking—we landed at 11:00. You can eat at the restaurant on the field and I’ve heard they may waive the landing fee if you eat there. Whatever the fee is it’s well worth it. If you’re familiar with the term “island time” it all becomes very clear once you land at Katama. Everything slows down a bit, everyone is more friendly and not in a hurry to get anywhere. If you look up the term “laid back” in the dictionary you’ll probably see a picture of Martha’s Vineyard! You can take the shuttle bus into Edgartown for $1.25. It stops right beside the field and runs about every 15 minutes. As far as flying to the vineyard, there are two choices. Over the water if you’re comfortable with a long voyage over water, or over land. Be sure to use flight following if you go by land as there tends to be a lot of traffic. Keep it under 3000′ and just outside 128 and you’ll be clear of Boston’s class B airspace. I plot my route: LWM BED OWD 1B2. Boston approach is very helpful and professional. Credits: The picture of the Katama biplanes is from Wikimedia Commons.